Your work schedule may require you to stay glued to your office chair for long periods. It results in fast accumulation of fat in areas like the belly (or tummy), hips, and thighs or you get a disastrous apple figure to deal with. 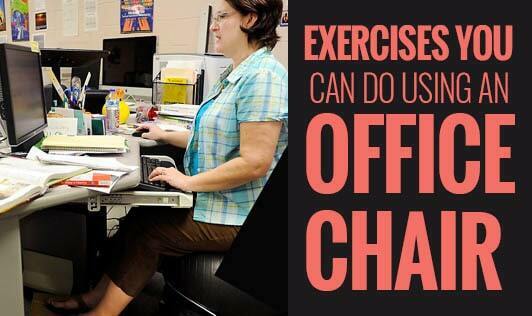 So, how can you sneak in some exercise on your chair for staying fit? Let’s find out. Sit straight and keep your legs folded at 90o. Now breathe deeply, pull in your stomach and count from 1 to 10. Exhale slowly. Repeat this at least 10 times. You can also try quick-paced short breaths. Tract you tummy in while exhaling short breaths. You should be able to complete at least 25 repetitions in a 20-minute time span. This works great on belly fat and improves blood circulation to the brain. Sit straight with the back placed stiff and fold your legs at a 90o angle. Breathe in, pull in your stomach and start lifting your right leg till you feel a stretch on the thigh and pelvic region. Count till 7, and then exhale while bringing your leg back into position. Repeat it with the left leg. Do 5 sets each on both legs to start with and progress to at least 15. Stationary cycling is a good idea too. Sit straight and move your legs in a cycling motion while breathing regularly. Do at least 25 sets. You will be able to feel the effect on the thighs, love handles, and tummy. These workouts are best suited for spot reduction. Include them in your work routine while sifting through e-mails and at break time. Though they may seem small, the results they provide could surprise you.